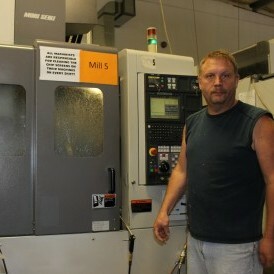 Aerospace Machine Shop: Capabilities at Global Machine Works, Inc. Global Machine Works offers a wide range of capabilities, specializing in multi-axis (3/4/5) cellular machining and turning of aluminum and hard metals. GMW is a leading service provider to a constantly evolving and highly technical industry. The GMW team prides ourselves in supporting the ‘quick turn’ demands of our customers – whether re-sourcing product from other suppliers or on newly engineered aircraft programs. Explore the pages below to learn more about our services. GMW provides assembly capabilities that include; pressing and swaging of bearings and bushings, fasteners installation, riveting, electrical bond testing, adhesive and sealant application. The high-speed 5-axis CNC horizontal cell capabilities that Global Machine Works employs provides our customers with the most cost effective methods for the complex machining of aluminum. In our 4-axis Makino Cells GMW maximizes machine utilization and minimizes labor costs by employing ‘Lights-Out’ technology to provide the greatest value to our customers. 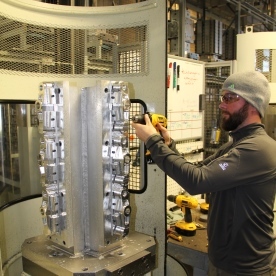 In addition to the complex 4/5-axis horizontal cells that GMW employs, we continue to support customer demand with numerous 3-axis vertical mills used for the machining of both aluminum and hard metals. Since the origin of Global Machine Works we’ve provided our customers with precision Turning and Turn-Mill capabilities. Additionally, our Lathe Shop supports machined Details used in our Assembly operations.